The traditional method of laser vision correction, the LASIK procedure, requires a mechanical blade to make an incision in the top layer of the corneal tissue prior to the correction itself. Millions of such corneal flaps have already been created using this safe technique. But sometimes the blade produces a rough corneal surface that can affect the quality of vision. Apart from that, many people decide not to undergo this procedure because they are uncomfortable with the idea of their eyes being touched by a blade. A microkeratome is a motorized razor-like surgical instrument that incises the flattened cornea to create the LASIK flap. For several years now it has been possible to create the flap using a so-called femtosecond laser. This means that no blade is involved in the procedure. Patients feel more comfortable, and the result is even better. Over one million patients have already undergone bladeless laser eye surgery. With a femtolaser, the flap is created by short bursts of light. Z-LASIK® is the most advanced innovation in bladeless surgery. This procedure uses a high-frequency laser. It is designed to create truly customized flaps, precisely, safely and pain-free Its beam is a 100 times less intense than that of the first-generation femtosecond lasers. Never before have safety, accuracy and patient comfort in laser eye surgery been so good, as proven by 500,000 successful Z-LASIK treatments. The LDV Femtosecond Laser uses ultra-short pulses of invisible light to gently separate the layers of the cornea. Z-LASIK has an extremely low impact on the eye: The procedure takes only a few minutes per eye. 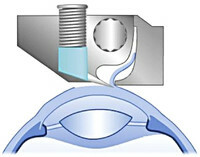 The time the laser is in contact with the patient’s eye is reduced to a minimum. Z-LASIK is comfortable and painless: The patient’s head is not fixed during the procedure. Z-LASIK also helps in severe cases: Thanks to the extremely high frequency of the laser pulses, the layers of the cornea are separated with unprecedented precision, creating an ultra-thin flap. Z-LASIK is therefore effective in patients who were previously not candidates for laser surgery. This includes patients with extreme myopia or thin corneas. 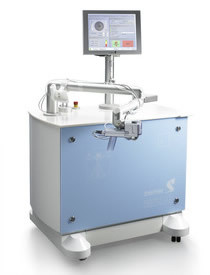 No inflammation: The laser energy used for Z-LASIK is about a 100 times less powerful than with other laser procedures. This is more gentle to the corneal tissue and prevents temporary inflammatory reactions of the eye. Fast result: The recovery period is considerably shorter than for other techniques. Patients are usually able to see well within a few hours. 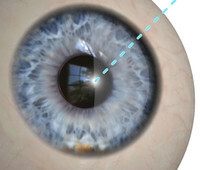 Fewer side effects: Z-LASIK enables the sugeon to enlarge the treatment zone. This reduces the risk of undesirable side effects such as dry eyes, deteriorated night vision or haloes (rings of light that surround point sources of light).